As overlanders, many of us are probably aware that Australia is the driest inhabited continent on Earth. Indeed, 70 percent of the Australian mainland is classified as semi-arid, arid or desert receiving just 500mm of rain annually. Our deserts are distributed throughout the western plateau and interior covering an area equal to 18 percent of the total mainland. In both arid and desert zones, winter nights can fall below freezing before rising during the day to reach regular maximums of 37-39C. At times temperatures will climb higher than 50C. This all goes to make the issue of desert survival a pretty hot topic, right? While most of us would like to think that ‘it won’t happen to us’, being prepared for the unexpected makes sense. This starts with ensuring that others know where we’re planning to travel and by ensuring that our kit and our capacities are suited to the task ahead. Importantly, we need to know the basic principles of desert survival – which includes being able to recognise when we’ve actually run into danger before plunging into disaster. While the practice of desert survival can be regarded as a profession in its own right, here are some principles to help point you in the right direction if you find yourself stuck up a dry creek without a paddle. Before looking specifically at the principles of desert survival, it’s worth knowing how the human body’s natural thermostat works. It will come as no surprise to hear that, in hot conditions, the human body sweats. This achieves dual benefits. Firstly, sweat makes our skin feel cooler by making it wet. Secondly, when sweat evaporates on our skin, it removes some of our body heat. The downside of this process is that, when we sweat, our body loses precious water which is then no longer able to support our bodies’ other essential functions. Left unchecked, dehydration can become a real risk. So a key principle of desert survival involves finding ways to reduce body heat while minimising the amount of water we lose through sweat. We also need to consider how our bodies deal with cold. When the desert temperature drops at night, our bodies will naturally try to warm us up by shivering. The trouble is that shivering utilises precious energy. And, in an emergency situation, this is energy that you may not wish to lose. Without care, hypothermia may set in. So another tenet of desert survival centres on being prepared to stay warm. Knowing this, the following desert survival rules take these physical characteristics and adapt them into common sense principles. Apply them, and you’ll be far better prepared to deal with the challenges that may arise unexpectedly in the great outdoors. Stay fully clothed with loose ventilated clothing, preferably in two layers. This ensures that your sweat is trapped close to your body, helping you to stay cooler for longer (think of the operation of an old fashioned meat sack). Failure to do this may see your sweat evaporate into thin air quicker than beer on a buck’s night. Protect yourself against dehydration and injury by avoiding sunburn, windburn and sand rash. If your vehicle breaks down – don’t leave it. It’s easier to find from the air than you are. If you do need to move from your location, travel in the evening/night or early morning and only when you are certain that you have sufficient water and you're sure of your destination. Whether you carry the water with you – or you know for absolute certain that there’s water where you’re going – don’t leave your hydration to chance. No ifs – no buts. Know that smoking and drinking alcohol will increase your risk of dehydration. And, when the going gets tough, even talking should be minimised in order to reduce water loss caused by the unnecessary expiration of your breath. Institute a water drinking policy before you and your travel party are too distressed to think straight. And be sensible about how water is rationed. After all, the best place to store water is in your belly. There’s an old saying that applies in desert survival situations: ‘Ration your sweat not your water.’ So exert physical effort only in the cool of the evening/night and in the early morning. Don’t eat food unless you have water available, too. After all, the process of food digestion requires the presence of water. And this processs is further aided by the presence of salt. So consider making an emergency electrolyte with 1L of water, 1tsp (a sachet) of sugar and one 1/3ts of salt (you’ll never look at the condiments section at Maccas the same way again!). Regardless of your location or the prevailing climactic conditions, there are four principles of ‘self-aid’ that apply in an emergency situation. The universal mantra is: ‘Please Remember What’s First’ which stands for the priorities of survival: Protection, Rescue, Water and Food. You need to protect yourself from the sun, so erect a shelter as a first priority. Make sure to face it south to maximise shade but also consider things such as the prevailing winds which can dehydrate you. If you are with your vehicle, modify it to provide shade. And consider supplementing this form of shelter with natural materials to provide a cooler shade than man-made products. If you’re on foot, improvise shelter from what you’re carrying with you. If you’ve had the foresight to carry a first-aid kit, it may include a survival blanket and aids for constructing a shelter such as parachute cord and a knife. If not, you’ll simply have to work with the natural materials that you can find around you. A simple method of enhancing your protection in arid and desert terrains is to dig a pit 75cm deep where you can lie on the cool of the earth underground during the day. It may look like a grave, but it can be effective. Consider too that natives in arid countries across the world make shelters off the ground. A common structure is a flat top roof over four poles protecting a simple bed platform 30cm off the ground. Strike a light. In a survival situation it could be the key to your rescue. Not only does fire give off warmth on a cold desert night, but it can also be seen for miles. Similarly, smoke is highly visible during the day. So, to attract a rescue party, stoke your fire with green vegetation – and not just a handful. We’re talking about a quantity the size of your car. Speaking of your car, it’s full of shiny things like mirrors. Dust them off and string them up. Have you heard of a tinsel tree? It involves tying mirrors, aluminium foil and torn strips from your emergency blanket to a distinctive shrub. They’ll act as signal beacons in the wind catching the sun’s rays. It’s unlikely to attract Santa, but it may very well catch the attention of your would-be rescuers. To increase your chances of attracting aerial rescue assets, lay your survival blanket out on the ground in an obvious place, pinned down at the corner by rocks. Or make a simple 6M-long letter ‘V’ out of man-made or natural objects that will stand out against the terrain. These markers can offer an obvious ground signal to pilots indicating that you need help. 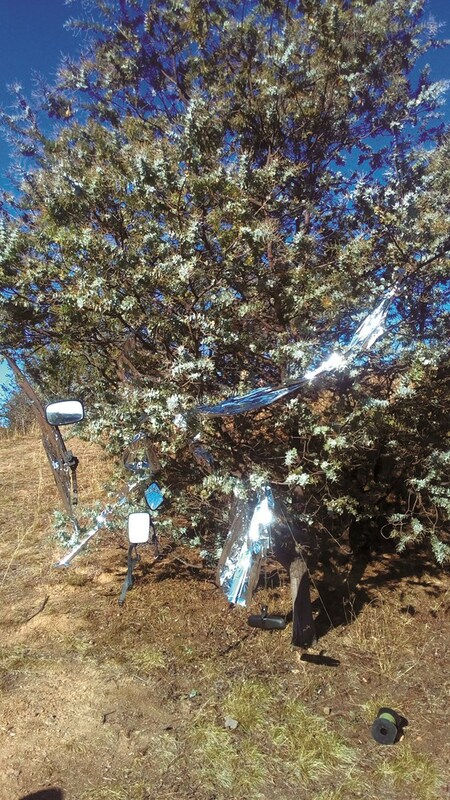 Similarly, transpiration bags attached to tree branches will act as a passive signal due to their contrast with the local environment. As we said at the outset, it’s really important to be able to conserve sweat in a desert environment. So, rest up during the day and protect yourself from the sun. Physical exertion – such as seeking out water – should be done in the cool of the evening. Meanwhile, in the cool of the morning, get up and collect the dew of the windows of your car. If you're still hydrated enough to pee – don’t be silly enough to drink it. It’s your body's waste fluids and it houses bacteria. You can, however, urinate centrally and extract the water from it via a solar still. Before you set off on your adventure, ensure that you have at least 6L of water with you per person, per day. Then add an emergency 72hrs more water for contingencies. After all, you never know when a simple day out in the scrub will put you to the test in ways you’d never expected. If you don’t have much water, minimise your food consumption. But when the conditions are right for eating, don’t be squeamish. There are more potential food sources in desert environments than an urbanised palate may care to imagine. Consider, for example, insects. Did you know that grasshoppers (by weight) have more protein than beef? And don’t forget where flour comes from. From seeds, of course. Acacia and wattle seeds can be eaten raw. The bean of the Queensland Bean Tree tastes like chestnuts when boiled. If you’re looking for something more substantial, think about what options you may have to catch small game. A snare trap is something that you should be able to improvise from wire in your survival kit or from unessential wires under your bonnet. Look for lush green vegetation. It’s a dead giveaway for the presence of water. It may be that the water table is closer to the ground in the area or that a dam, bore or natural spring is present. Identify animals and follow them to water sources. Did you know that game trails converge as you get closer to water with the convergence generally pointing in the direction of a water source? Look for low terrain. Why? Because water flows downhill. If there are no obvious wells or bores, keep an eye out for rocky outcrops where water may be trapped. Carry transpiration bags and know how to use them. If you don’t have custom transpiration bags, use garbage bags. Orientate them to have a northerly aspect. This will ensure that the bag’s exposure to the sun is maximised which will, in turn, result in more collected water. Create a solar still. In the daytime, the still can be fed with unclean water that will evaporate and collect as drinkable water in the collecting vessel. In the morning, the early bird gets the worm. Similarly, the early riser can harvest the dew that’s collected overnight on the surface of the solar still (this is called ‘a dew trap’).